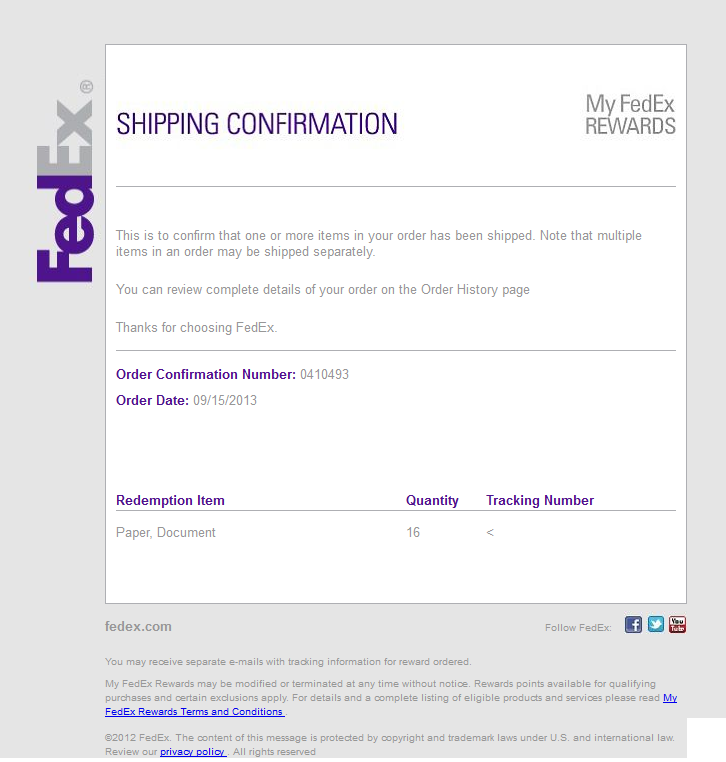 This fake FedEx email has a malicious attachment. A couple of binaries are dropped onto the system, a.exe (detection rate 2/53) [may not be malicious] and a2.exe (detection rate 7/53). The payload seems to be Nemucod / Crypted or some related ransomware. 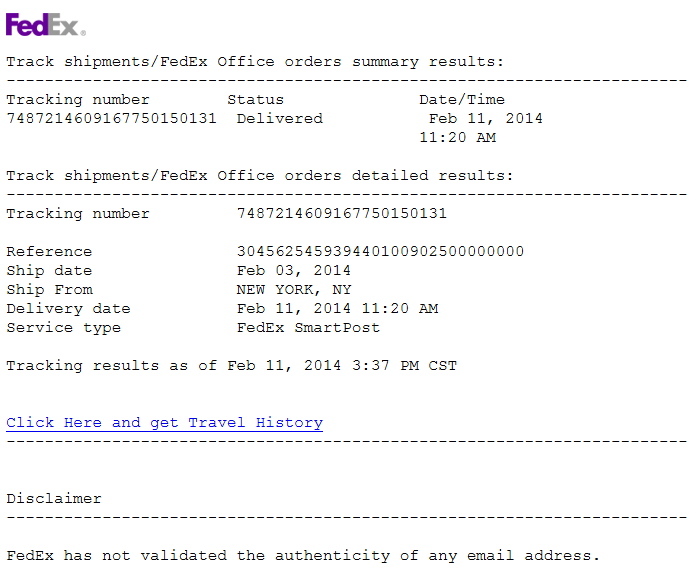 Malware spam: "Samson Floyd agent Fedex" / "FeDex-service"
We attempted to deliver your item on March 07th, 2016, 11:40 AM. I would suggest that the entire 151.80.76.200/29 range is questionable and should be blocked. None of the automated tools I ran     gave any insight as to what the malware does, but it is clearly something malicious. Malware spam: "Unable to deliver your item, #000022074" / "FedEx 2Day A.M"
This fake FedEx spam has a malicious script attached. Which is saved as %TEMP%\11827407.exe. This has a low detection rate of 3/56. Automated analysis tools    don't give much of a clue as it has been hardened against analysis. UPDATE: This tweet gives a bit more insight into the malware.. So, I would definitely recommend blocking 91.231.87.90 and also the domain coldserv24.com which is hosted on that server and may be malicious. 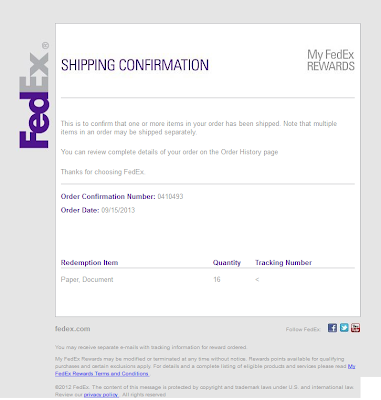 FedEx has not validated the authenticity of any email address. In this case, the link in the email goes to [donotclick]pceninternet.net/tracking.php?id_7487214609167750150131 which downloads an archive file track_shipments_FedEx.zip. which has an icon that makes it look like a Word document. This has a VirusTotal detection rate of 15/49, but automated analysis tools are inconclusive as to its payload   . Subject: Your Fedex invoice is ready to be paid now. The following partial blocklist covers these two IPs, but I recommend you also apply this larger blocklist of related sites as well. You have a new invoice(s) from FedEx that is prepared for discharge. Please Not try to reply to this message. auto informer system cannot accept incoming mail. The malicious payload is at [donotclick]vespaboise.net/detects/invoice_overview.php which is on the very familiar IP address of 222.238.109.66 (Hanaro Telecom, Korea) which has been used in several recent attacks.. blocking it would be prudent. In the first case, the malicious payload is at [donotclick]dushare.net/main.php?page=c82ec1c8d6998cf0 (report here) hosted on 203.91.113.6 (G Mobile, Mongolia). In the second case the payload is at [donotclick]gsigallery.net/main.php?page=2bfd5695763b6536 (report here) also hosted on 203.91.113.6. The following domains are on the same server and should also be treated as being suspect. 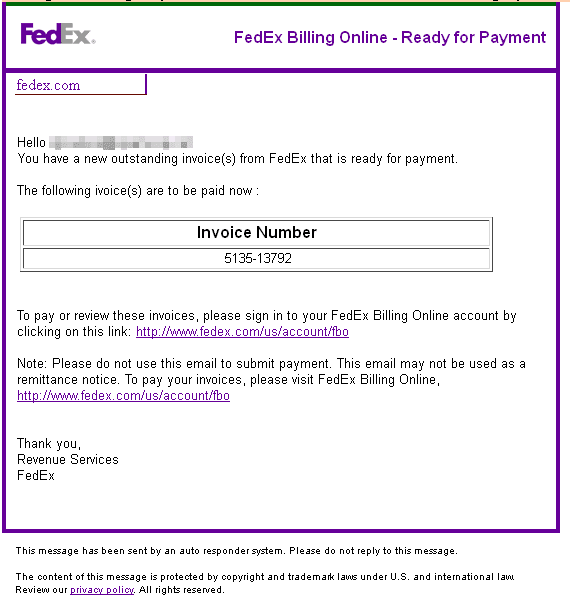 You have a new not paid bill from FedEx that is ready for payment. 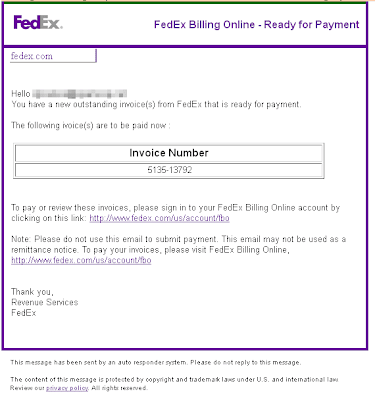 Pay your Fedex invoice online. Your Fedex invoice is ready to be paid now. Please pay your outstanding Fedex invoice. Your Fedex invoice is ready.